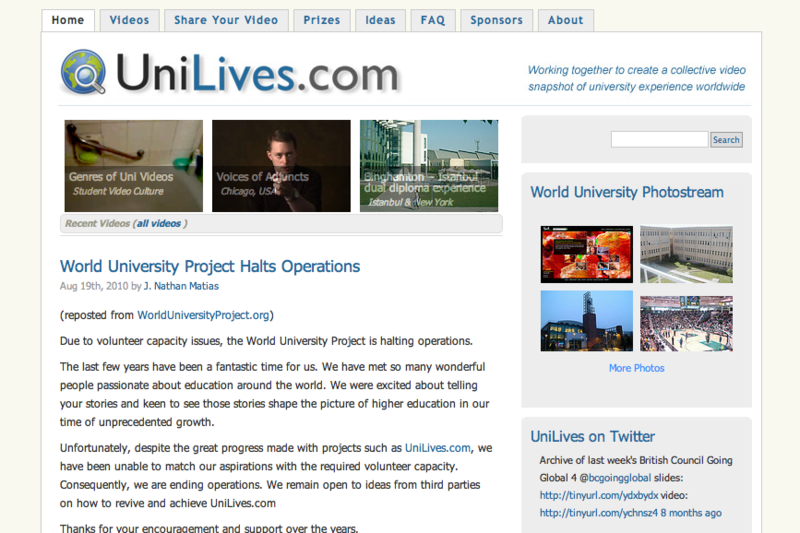 The University Lives Collection aimed to work together with students to create a collective video snapshot of university experience worldwide. Students would upload short journalistic videos, and we would publish them in a linked network of related student videos. As executive producer, I had major oversight over this project. At the height of this project, we had around 20 people involved on a voluntary or advisory basis. In 2009/10, we negotiated agreements with the Times Higher Education, Automattic, and Magnatune to launch this project to a thousand universities worldwide. Unfortunately, several key volunteers were not able to participate in the ways they had expected. As a result, we had to cancel our plans to run the University Lives Collection in conjunction with the THE/Reuters World University Rankings. The project is now dormant. I welcome substantive offers of interest in reviving it.